Donna Tartt does not write short books. She writes ridiculously loooooooong books. You may have gleaned that, generally speaking, I am not a fan of ridiculously long books. Most of the time, when a book is too long (like this one or this one), it just means there’s a lot of extraneous crap in there that could have been cut out. Too long usually begins at about 400 pages and goes on (and on and on and on and on and on) from there. There are, of course, exceptions. Tartt’s first novel, The Secret History, which (as I’ve mentioned before) is really great and is on my list of books you should read, clocks in at nearly 600 pages. So, I began The Goldfinch with an open mind. In fact, I was really excited to read it. Unfortunately, my worst fears were realized. John: Oh, how is that?? Me: Not as good as The Secret History. Too damn long. Must be longer than Secret History. How long was that? This effer is 800 pages. Me: I’m saying. And, I’m sorry, but that’s a commitment. If I gotta spend that much time with you, you better be really good. It ain’t light, quick reading either. Sheesh. And that about sums it up. But, let me back-track a little bit, because I fear I’m giving the book a bad rap. It is NOT, by any means, a bad book. In fact, it’s a pretty good book. It is also a book that would be RUINED if I told you very much about it. So I won’t. But I will tell you the basics. First things first: this is the titular goldfinch. 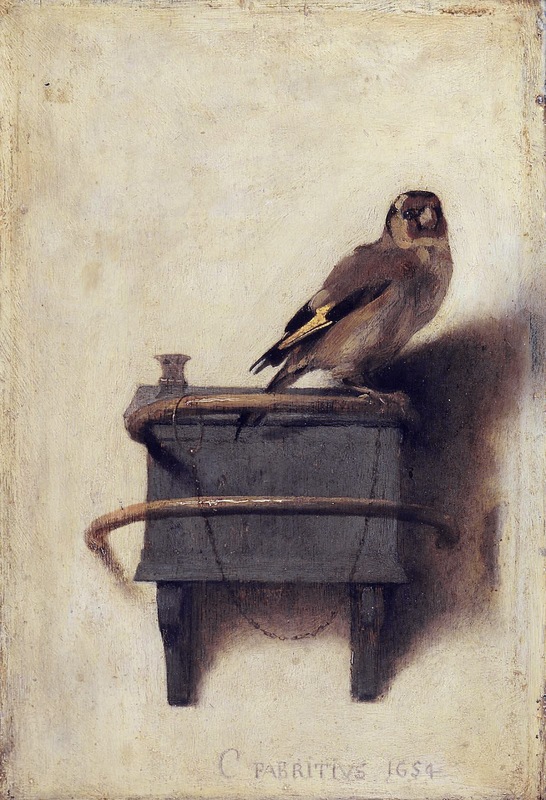 The Goldfinch is a painting by Carel Fabritius, who was a Dutch painter and one of Rembrandt’s students. He died in 1654, at 32, when a gunpowder store exploded, destroying a quarter of the city of Delft and blowing up Fabritius’s studio (and Fabritius, who was in his studio at the time). The studio housed much of his work, and, as a result, only a handful of his paintings still exist. The Goldfinch, painted the year of his death, is the most famous of these works and now hangs at The Mauritshuis in The Hague. The Goldfinch plays a major role in the book. Theo Decker (who, at the beginning of the story is 13 years old) has been suspended from school. He and his mom are on their way to a meeting at the school to discuss his behavior. They are early, so they pop into the Metropolitan Museum of Art for a quick look at a temporary Dutch installation, which includes (you guessed it!) The Goldfinch. Theo’s mom is a big fan of art and art history. She adores The Goldfinch, and as they are looking at it, she tells Theo all about it and Fabritius and the Delft explosion. And soon thereafter, all hell breaks loose. What happens in the rest of the book includes ridiculous adventures, destructive behavior, heartbreaking sadness, and much, much more (you can fit a lot into 800 pages, after all). Theo is a tough nut to crack. Tragedy is so normal to him that he appears immune to it. He recognizes certain people’s faults but trusts others to a fault. He is riddled with guilt, unhappy, conflicted. But his love (for both people and things) is deep and fierce and unwavering. Through and with Theo, the book looks at some “big questions,” foremost of which: right versus wrong. There is no question that Donna Tartt can write. She has a kind of weird, formal, old-fashioned style that initially made me question the present-day setting. This is an odd example, but it is one that stood out to me: she uses the term “harum-scarum” three times in the book. Toward the end of the book, she employs style and technique to convey different emotions and states-of-mind (run-on sentences, lack of punctuation, extended dialogue, etc.). Despite the fact that it’s a little out-of-place as compared to the rest of the novel, it’s pretty effective. The Goldfinch is definitely not as good as The Secret History, but it’s still worth reading if you’re willing to wade through it. Admittedly, this is a better book than many of the other books I’ve rated 3.5. But my standards are a little higher if a book is 800 pages long. I think that’s perfectly reasonable. Who should read it: people who enjoy great writing, fun characters, and wild (read: implausible) stories . . . and don’t mind committing weeks to a book. I can’t say it enough times: Read The Secret History. 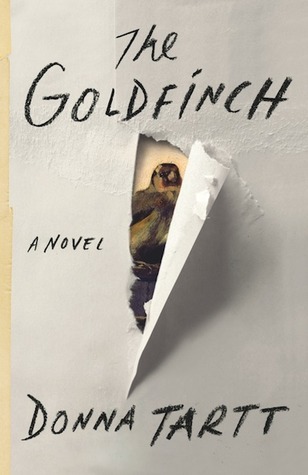 This entry was posted in Rating: 3.5/5 and tagged Book review, Books, Donna Tartt, The Goldfinch. Bookmark the permalink. ← #tbt, Part 3: Halloween Edition! Totally Agree! The book is just too long–too big an investment for the return. She writes well, but with far too muh description and after a certain point, we don’t need more new characters. Overall, what started as a great read became a chore to finish, and the ending was anticlimactic. Overall, it’s not worth the time. Had it been edited down a couple hundred pages, it could have been a very successful book. I was definitely disappointed.